Enter your ancestor's name below and we'll search SSDI to help you learn more. Want to get to the beginning? Start at the end. 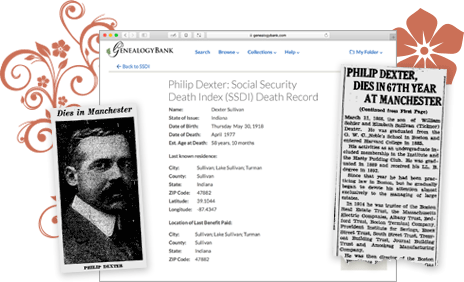 For many genealogists, the Social Security Death Index is the first step to accurately identifying ancestors and mapping out an accurate portrait of their family history. Social Security death records can help confirm the dates of birth and death of an ancestor, locate their last residence, and find out where an ancestor lived when their Social Security card was issued. Use these records to expand your family tree and uncover related family members. Combined with their newspaper obituary, you can find detailed and valuable information about your ancestors, such as their career, hobbies, civic associations, academic affiliations and a list of close relatives. This information provides more pieces of the puzzle for finding out more about your family history. And in some cases, the SSDI can often provide ‘cause of death’ report, which may help reveal or confirm possible examples of hereditary medical conditions that may run in the family. Why Use GenealogyBank's SSDI Collection? GenealogyBank is the only U.S. Social Security Death Index database that is updated weekly - including corrections to old death records, as well as new names of the recently deceased. Our SSDI records are integrated with the other GenealogyBank online collections for the most robust family history research tool. 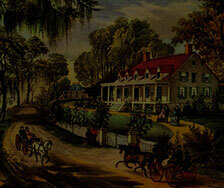 Find an ancestors’ official death record and then uncover their life through details preserved in newspaper archives. A combined search of the SSDI and GenealogyBank’s newspaper obituaries can provide 98% of recent annual U.S. deaths. When you search for your ancestor by name, you’ll receive an integrated search result that includes the obituary or death notice along with the same name that is in the SSDI database making it easier to verify if this is the same person. Name searches in the Social Security Death Index are processed against three fields of data—the first and last names of the deceased, and his or her middle initial or name. Only the first 10-12 letters of first names are shown in the SSDI and only middle initials are recorded. To search for ancestors with names more than 12 letters use only the first 12 letters to avoid getting an incorrect not found error. Search for your married female ancestors by their married names vs. maiden names. Search by name variations and nicknames if you’re having difficulting finding your ancestors’ records. Refine your search by adding birth or death date years and/or zip codes. The death place in the SSDI may not be the actual place of death as it’s the last residence the Social Security Administration had on file. Use their obituary to cross reference this information. Keep in mind that before SSNs were linked to death records, someone might be missing from the index if the Social Security death benefit was never requested, there was an error on the form requesting the benefit, or an error was made when entering the information into the SSDI.